Comprising an area of 514,000 square kilometers (198,456 square miles) in Southeast Asia, Thailand (formerly known as Siam) extends almost two-thirds down the Malay Peninsula. Comparatively, the area occupied by Thailand is slightly more than twice the size of the state of Wyoming. Thailand may be divided into five major physical regions: the central valley, fronting the Gulf of Thailand; the continental highlands of the north and northwest, containing Thailand's highest point, Doi Inthanon (2,565 meters/8,415 feet); the northeast, much of it often called the Khorat Plateau; the small southeast coastal region facing the Gulf of Thailand; and the Malay Peninsula, extending almost 960 kilometers (600 miles) from the central valley in the north to the boundary of Malaysia in the south. Thailand has a tropical climate. 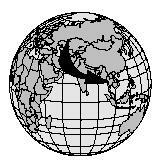 In most of the country, the temperature rarely falls below 13°C (55°F) or rises above 35°C (95°F). Until 1939, the country we call Thailand was known as Siam. It was the only Southeast Asian country never colonized by the West. This helped Thailand to maintain its own special cuisine (cooking style). However, that cuisine had already been influenced by Thailand's Asian neighbors. The Thai (pronounced TIE) people migrated to their present homeland from southern China about 2,000 years ago. They brought with them the spicy cooking of their native Yunan province, as well as its dietary staple, rice. Other Chinese influences on Thai cooking included the use of noodles, dumplings, soy sauce, and other soy products. Like the Chinese, the Thais based their recipes on blending five basic flavors: salty, sweet, sour, bitter, and hot. From nearby India came not only the Buddhist religion, but also spicy seasonings such as cumin, cardamom, and coriander, as well as curry dishes. The Malays, to the south, further shared seasonings, as well as their love of coconuts and the satay (a dish that is similar to shish kebabs). Since 1970, Thai cooking has become extremely popular in both North America and Britain. Rice is the main dietary staple of Thailand. Thais eat two kinds of rice: the standard white kind and glutinous, or sticky, rice. Sticky rice rolled into a ball is the main rice eaten in northeastern Thailand. It is also used in desserts throughout the country. Rice is eaten at almost every meal and also made into flour used in noodles, dumplings, and desserts. Most main dishes use beef, chicken, pork, or seafood, but the Thais also eat vegetarian dishes. desserts. Many dishes are served with sauces, such as Nam Pla Prig, for dipping. Coconuts play an important role in the Thai diet. Coconut milk and shredded coconut are used in many dishes, especially desserts. Thais eat a variety of tropical fruits for dessert, including mangoes, papayas, custard apples with scaly green skins, and jackfruit, which is large and prickly and has yellow flesh. Thai food differs somewhat from one region to another. Seafood is popular in the southern coastal areas. The Muslims in that part of the country favor curries. The spiciest food is found in the northeast. Spicy Thai dishes are often balanced with the tart flavors of such ingredients as lemon grass, ginger, lemons, and limes. This sauce is used as a dip. It is provided on the table at every Thai meal, in the same way that salt and pepper are provided on most tables in North America. If sauce is too salty, add more water. Serve at room temperature in individual bowls. Keeps for up to 2 weeks in the refrigerator, tightly covered. Slice the steak into pieces ¼-inch thick, 2 inches long, and about 1-inch wide. Heat 1 cup of the coconut milk in a wok or frying pan and add the red curry paste. Stir to dissolve and cook at high heat for 5 to 6 minutes, until the oil of the coconut milk rises to the top and the sauce thickens. Add fish sauce and stir it in. Add the second cup of coconut milk and the beef. Reduce heat to medium. Add the bamboo shoot strips and the sugar. Return the heat to high and add 3 Tablespoons water. Cook, stirring for 3 minutes until bubbling. Add ¾ of the basil leaves, the red pepper strips and the green peas. Stir and cook for another 30 seconds, folding all the ingredients into the sauce. Remove from heat and transfer to a serving dish. Top with the rest of the basil leaves and the additional red pepper strips. Serve immediately, accompanied by steamed rice. Chicken satay may be served as an appetizer, snack, or main course. Slice chicken breasts into thin slices lengthwise. Each slice should be about 4 inches by 1 inch by ¼ inch. (Optional: place chicken in freezer for 15 to 20 minutes to make it easier to slice.) Place the chicken strips in a mixing bowl. Add remaining ingredients, first the solids, then the liquids, to the bowl. Toss until well mixed. Let the chicken marinate (absorb the flavoring) in the refrigerator for at least 2 hours and as long as 24 hours. When ready to cook the satay, stir the chicken in the sauce and remove. 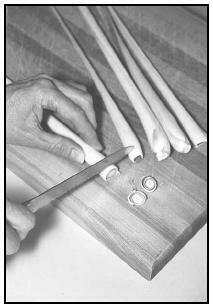 Thread each slice onto a skewer, pushing the skewer in and out down the middle of the slice. Baste (rub) the chicken with oil or coconut milk and grill on a barbecue or under the broiler. Cook for about 2 minutes on each side, watching carefully and turning to keep the chicken from burning. Baste once more with oil or coconut milk. The satay is done when it's golden brown and crispy along the edges. Serve with optional garnish with fresh coriander leaves. Wash and dry the cucumber, and peel it if desired. Cut in half lengthwise and then into quarters. Slice the quarters into ¼-inch pieces and arrange on a plate. Slice the red pepper and onion into thin strips. Scatter them over the cucumber. In a small bowl, combine the sugar, vinegar, and salt. Pour dressing over the vegetables and top with the coriander leaves. Although most Thais are Buddhists, there are no food taboos in Thailand. The Thais celebrate a number of seasonal festivals and Buddhist holidays with feasts and banquets. Some of the foods eaten at these meals have a symbolic meaning. Among these are "golden threads," a thin layer of egg or noodles wrapped around small pieces of food. It is thought that they bring good luck and wealth to the person who eats them. Like the Chinese, the Thais believe that long noodles symbolize long life. Grilled, baked, or fried chicken is a popular food for holiday banquets. While everyday meals end with fruit, sweet desserts are served on special occasions. These fall into two categories: cakes ( kanom ) and liquid desserts, such as bananas and coconut milk. One of the most important feast days is Songkran, the traditional Thai New Year, celebrated in April. People throw buckets of water at each other to let everyone start fresh for the coming year. Egg rolls are traditionally eaten for Songkran, as well as other holidays. Custard is another traditional dish served on Songkran. 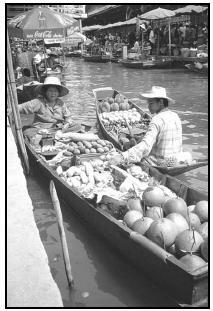 Thai fruit and vegetable vendors often sell their wares from long boats, moving from dock to dock to serve their customers. If using black mushrooms, soak them in hot water for 15 minutes. Drain well in a strainer. Discard mushroom stems and shred caps. Soak noodles in hot water according to package directions. When soft, drain and cut into 2-inch pieces with a sharp knife or scissors. In a large bowl, beat egg well. Add black mushrooms, noodles, pork, beef, carrots, bean sprouts, onion, fish sauce, pepper, garlic, and sugar. Mix well. Place 1 wrapper on a flat surface. Cover remaining wrappers with a slightly damp kitchen towel so they don't dry out. Place about 1½ Tablespoons of filling just below the center of each wrapper and fold up into a roll. Press edges to seal. In a large skillet or wok, heat oil over medium heat for 1 minute. Carefully place 3 rolls in oil and fry slowly for about 10 minutes or until golden brown. Turn and fry the other side 10 minutes. Keep fried rolls warm in oven heated to 200°F. Serve hot with individual bowls of nam pla prig or with sweet-and-sour sauce. In a deep bowl, beat eggs well. Add brown and white sugars and stir until dissolved. Add coconut milk and squash and stir well. Pour mixture into a 9- by 9-inch baking pan or a 9- or 10-inch pie pan. Place ½ cup water into a steamer or Dutch oven large enough to hold the custard pan. Bring water to a boil over high heat, and place pan with custard inside. Cover and steam over high heat for 30 minutes. Peel the bananas and cut in quarters. Place in a steamer over boiling water. Steam for 20 minutes; set aside. In a large pot heat the coconut milk, sugar, and salt on high heat. As soon as it boils, add the bananas. Thais are famous for their love of snacks. There are food stalls near every public place due to the Thai habit of snacking all day. These stalls sell hundreds of different snacks. Among the most popular are fish cakes, egg rolls, fried rice, and noodles served with a choice of seasonings. Thais eat three meals daily, plus many snacks. Dinner is the main meal. Breakfast often consists of fried rice, boiled eggs, and foods left over from the previous day's dinner. Lunch is usually a single-dish meal based on either rice or noodles. The main meal, eaten at dinnertime, consists of several different dishes chosen to balance different flavors and cooking methods. Soups are served with most main meals and are sipped throughout the meal. A typical dinner is steamed rice, a curry dish, a vegetable dish, a cold salad, and soup. Rice is the only food placed on each person's plate. All the other dishes are brought to the table in serving bowls, and people help themselves. Fresh fruit is served at the end. Unlike their Asian neighbors, Thais do not use chopsticks unless they are eating noodles. Most of the time they use a fork and a flat-bottomed spoon. The fork is used only to push food onto the spoon, not to bring it to one's mouth. Food is already cut into bite-sized pieces, so a knife is not needed. Thais like their food to please the eye as well as the taste buds . They carve fresh fruits and vegetables into fancy shapes and serve prepared foods in pretty containers. In a large skillet or wok, heat oil over high heat for 1 minute. Add fish, garlic, and ginger. Cook, stirring constantly, for 3 minutes or until fish becomes white. Add pineapple, coconut milk, fish sauce, pepper, sugar, and cayenne pepper and stir well. Cook, stirring constantly, for 2 minutes or until fish flakes easily. Serve over hot rice noodles, topped with fresh mint and coriander. This is Thailand's most famous noodle dish. In a large bowl, soak noodles in cold water 45 minutes. Drain in a colander (special bowl with holes for draining) and set aside. Heat olive oil in a large skillet over high heat. Add garlic and sauté until lightly browned, about 1 minute. Add shrimp and tofu and sauté 1 minute. Add eggs and stir 30 seconds. Add noodles, peanuts, fish sauce, vinegar, sugar, paprika, and red pepper and stir constantly for 3 minutes. Remove from heat and transfer to a platter. Sprinkle with bean sprouts and leeks and serve. Lemon grass may sometimes be found in supermarkets. Although it looks leafy, the stalk is tough and must be pounded with a rolling pin or mallet to release its flavor. The lemon grass may be pounded either before or after slicing. Slice chicken into thin strips. Smash the lemon grass once with a rolling pin. Cut it into 1-inch slices. Cut the ginger into thin slices and cut the chilies in half. Add the lemon grass, ginger, and chilies, and cook for another 2 minutes, stirring continuously and not letting the liquid boil. Add chicken strips and cook for 5 minutes, stirring over medium heat, until the chicken is cooked. Lower heat if mixture starts to boil. Add lemon juice, lime juice, fish sauce, and sugar. Stir and continue cooking for another minute or two. Pour soup into a serving pot and serve immediately, topped with fresh coriander leaves. About 24 percent of the population of Thailand is classified as undernourished by the World Bank. This means they do not receive adequate nutrition in their diet. Almost all of the population (94 percent) has adequate access to sanitation. Of children under the age of five, about one-quarter are underweight, and nearly 22 percent are stunted (short for their age). Despite malnourishment, Thailand is the world's largest rice exporter, accounting for over 22 percent of all agricultural exports by value in 1997. It also provides about 95 percent of the world's cassava (tapioca) exports. The government, however, has initiated large-scale irrigation projects, introduced higher-yielding varieties of rice, and encouraged mountain villagers to grow coffee, apples, strawberries, and other crops in an effort to increase exports and compete in the global market. Halvorsen, Francine. Eating Around the World in Your Neighborhood. John Wiley & Sons: New York, 1998. Harrison, Supenn, and Judy Monroe. Cooking the Thai Way. Minneapolis: Lerner Publications, 1986. Rutherford, Scott, ed. Insight Guide Thailand. Singapore: APA Publications, 1998. Sananikone, Keo. Keo's Thai Cuisine. Berkeley: Ten Speed Press, 1986. Young, Wandee, and Byron Ayanoglu. Simply Thai Cooking. Toronto: Robert Rose, 1996. Asia Foods. 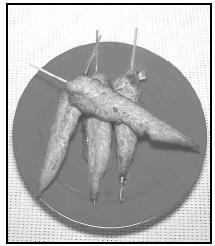 [Online] Available http://www.asiafoods.com (accessed February 7, 2001). Bangkok Cuisine. [Online] Available http://bangkokcuisine.com/original/bangkok/recipes.htm (accessed July 19, 2001). [Online] Available http://www.orientalpantry.com (accessed February 7, 2001). Green curry? "Pad Thai"? Chicken rama? Not in northern Thailand—at least, not traditionally. Thailand's food is devoutly regional, and that of its northern provinces couldn't be more different from the overwhelmingly Bangkok- and Chinese-influenced dishes served at most Thai restaurants in the U.S. When it comes to northern Thai food, you can forget any notions of sweet, stir-fried dishes or ingredients such as coconut milk or shrimp. The food of Thailand's North is predominantly earthy, meaty and rustic, relying on ancient techniques like grilling and fermenting, and obscure ingredients including water buffalo and bitter herbs. Even Thai staples such as fish sauce have made few inroads into landlocked and remote northern Thailand. And compared to the country's other regional cuisines, northern Thailand's dishes are graciously mild, getting their kicks from a few select herbs or relatively mild spice pastes, rather than from a handful of chiles. Northern Thailand's rice fields constitute around 20 percent of the country's land dedicated to rice agriculture. In the more remote regions, much of the planting and harvesting continues to be done by hand, including here, outside Tha Ton, Chiang Mai. In parts of northern Thailand, such as the remote village of Tham Sakoen, Nan, planting and harvesting rice is a group effort, requiring the cooperation of the community for as long as a week. Those who pitch in are sometimes paid in rice. Making khanom jeen, thin noodles made from a rice flour-based paste, in Nan. A dish of khanom jeen nam ngiaw at a stall in Chiang Mai. Serving up bowls of khao soi at a restaurant in Chiang Mai. A man gathers makhwaen in Song Khwae District, Nan. The spice is gathered by hand from tall trees in Nan and elsewhere in northern Thailand beginning around October, and is dried before being used in a variety of northern Thai-style meat dishes. Grilling sai ua, a northern Thai-style sausage that combines pork and a variety of fresh herbs, at a market outside of Chiang Mai. A typical northern Thai grill. Moving clockwise from 12 o'clock: pork belly, chin and tongue; banana leaf packets of sour fermented pork; pork-and-herb sausage; eggs; and freshwater fish. A Shan cook making local-style sweets at his home kitchen in Mae Hong Son, Thailand. Tucking into an Akha-style meal in Chiang Rai. Like Thailand's other hill tribes, who tend to live in remote, elevated communities, the Akha are almost entirely self-sufficient, relying on a relatively simple yet full-flavored diet based around rice, vegetables and herbs. In recent years, restaurants in the U.S. like Pok Pok have shed some light on the dishes of Thailand's North, but most diners remain unaware of the region's fare, making it perhaps the least-known regional Thai cuisine, both in Thailand and abroad. So to give you a leg up, here's a crash course in northern Thai food: its staples, main dishes and influences. But don't make the rookie mistake of conflating northern Thailand with northeastern Thailand, the region also known as Isan. Although the two cuisines share some characteristics, U.S. Thai restaurant staples such as papaya salad and grilled chicken are Isan, not northern. Perhaps the most important food item associated with northern Thailand is rice. Yet unlike the fragrant, delicate, long-grain jasmine rice that's standard at your local Thai joint, the residents of northern Thailand traditionally eat sticky or glutinous rice, stumpy, starchy grains that are prepared by steaming rather than boiling. When cooked, sticky rice is kept warm in bamboo baskets called katip, and is eaten by hand, rolled into a ball and dipped into the various dishes. Your local Thai place may serve noodles, but it's unlikely it'll have khanom jeen, fine, round threads made from soaking, fermenting, grinding, pounding, boiling and extracting rice—almost certainly the most beloved noodle in northern Thailand. Served exclusively fresh and thus never exported, khanom jeen are also thought by some to be one of Southeast Asia's only indigenous noodle (most other noodle and noodle dishes eaten in Southeast Asia were introduced by the Chinese). The most common use of khanom jeen in northern Thailand is in a dish called nam ngiaw, a hearty, tomatoey, pork-based soup—a northern Thai Bolognese of sorts—supplemented with cubes of steamed pork or chicken blood. One noodle dish that has made it outside of the North is khao soi, a combination of wheat-and-egg noodles and a curry broth that was most likely imported to northern Thailand from Myanmar by Muslim traders from China. Khao soi is one of the few savory dishes in northern Thailand that employs coconut milk. A bowl is served with slices of lime; tart, crunchy pickled mustard greens; and bits of shallot—all effective foils to the rich broth. In the U.S., diners tend to associate Thai food with big, fragrant, fresh herbs, such as lemongrass, galangal and kaffir lime leaf. In northern Thailand, dried spices also play a big role. One of the most noteworthy is makhwaen, an evergreen shrub related to the Sichuan pepper and prickly ash. Makhwaen has a distinctively fragrant and spicy flavor and, perhaps most notably, imparts a slight numbing sensation. Another northern Thai staple that rarely makes it to U.S. menus is nam phrik, chile-based "dips." Northern Thailand's nam phrik superstar is undoubtedly nam phrik num, a combination of grilled chiles, garlic and shallots that have been pounded in a mortar and pestle to a stringy, spicy paste. A bit of nam phrik num, a basket of sticky rice and a few parboiled vegetables and deep-fried pork rinds is among the simplest—and most delicious—meals in northern Thailand. Your local Thai joint may serve larb (aka laap, larp or lahb), a tart "salad" of minced meat, fresh herbs and seasonings with roots in Thailand's northeast. But few diners, including most Thais, are aware of the version served across northern Thailand: a combination of typically raw, finely minced beef, uncooked beef blood, honeycomb tripe, a fragrant spice paste and fresh herbs. Indeed, northern Thais love their meat, and the most ubiquitous type of restaurant in the region is undoubtedly the bare-bones laap restaurant, which generally also features a grill of mixed meat, cheap rice-based booze and an almost exclusively male clientele. Thai dishes sold in the U.S. can often be traced back to Bangkok's royal palace, or even China. Northern Thailand's food is closer to what the Thai people probably ate centuries ago, when outside influences were fewer and less cosmopolitan. In Thailand's north, the influences tend to come from groups such as the Shan, a people closely related to the Thais who speak a similar dialect and share numerous cultural—and culinary—traits. The Shan are thought to have introduced khanom jeen nam ngiaw, as well as dishes like khao kan jin, rice combined with pork blood and minced pork, wrapped in banana leaf packages and steamed. Other influences have come from the region's so-called hill tribes, ethnic minority groups who inhabit the remote, mountainous areas of northern Thailand. 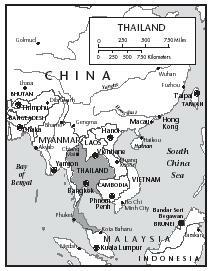 With origins in southern China and the Tibetan Plateau, these groups migrated south approximately 200 years ago, eventually settling in parts of Myanmar, Vietnam and Laos, and northern Thailand. Northern Thailand's hill tribes often rely on high-altitude, cold-weather crops not generally grown elsewhere in Thailand, such as chayote, potatoes and corn, some of which have made their way into the northern Thai repertoire. The Chinese have also influenced northern Thailand's food, both in the distant past, when Chinese traders leading mule caravans introduced khao soi, and more recently, when after the communist victory in 1949, Chinese soldiers fled their homeland for the remote regions of Thailand's north, settling in remote mountainous regions to grow tea and other crops.